In case you happened to find yourself having a group of TGA files (perhaps someone sent them by e-mail or transferred them to your computer) and are not sure how to handle them, here are some quick tips. The TGA (Truevision Graphics Adapter) format was created in the 1980s by a company called Truevision as a raster graphics file format and it is also referred to as ‟TARGA (Truevision Advanced Raster Graphics Adapter) format”. Though the company doesn’t exist anymore under this name, the file is still widely used for storing deep-pixel images and graphics that contain image data up to 32-bits per pixel. You will often find TGA images associated with 3D video games or have them used for still-video editing. TGA files can be handled using advanced graphics design programs such as Adobe Photoshop, Corel Draw or GIMP. They can also be opened by some photo viewers, such as ACDSee or Apple Quick Time Viewer. However, if you plan to share TGA files online, to transfer, send them by e-mail or make them widely available, the easiest thing to do is convert them to a more accessible format, such as JPEG. 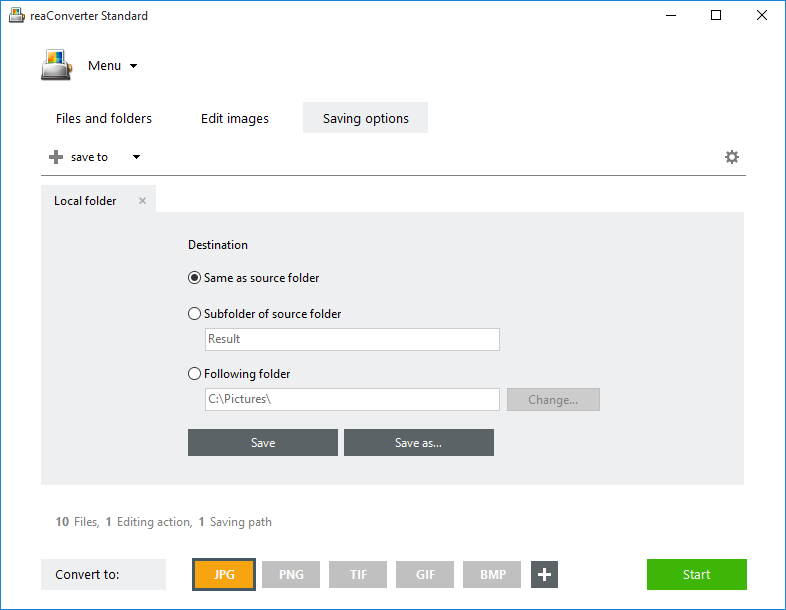 Managing the conversion of a group of files from TGA to JPEG format can be really easy when you are using a proficient converter such as reaConverter. 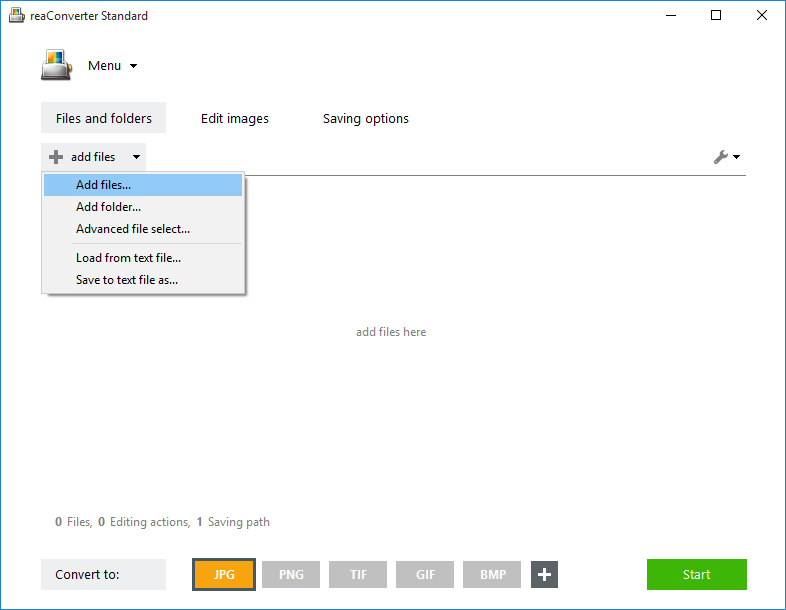 This software can be used for competently reading over 500 image formats and for writing over 50 types of image extensions. In the case of TGA, reaConverter supports conversion both to and from this format. Add all the TGA files you need to convert to the conversion list. By supporting batch conversion, reaConverter helps you save a lot of time and avoid doing recurring operations. Explore the wide array of image editing options made available by this software. Here you can opt for rotating or resizing all converted images, for adding image effects or correcting colors. You can also add an image or text watermark, so as to protect the rights of the image owner. 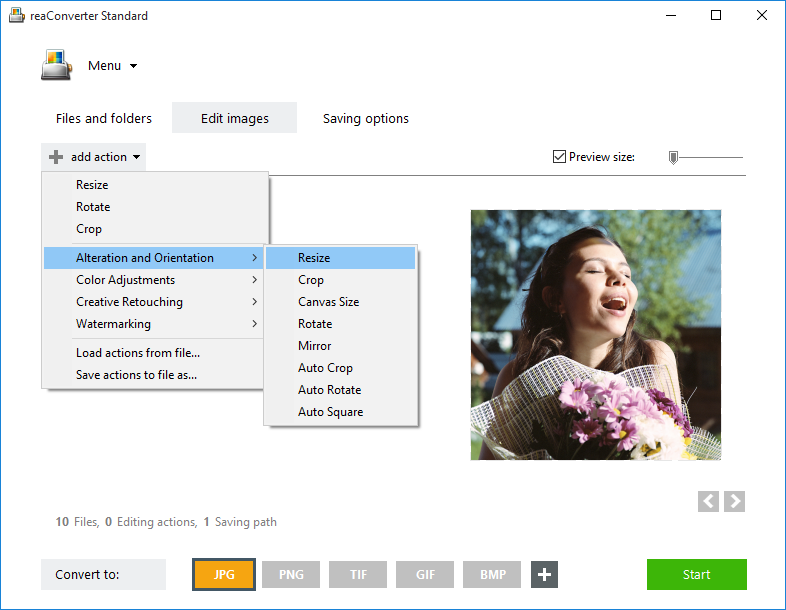 All the options you choose in this section can be tuned up and you can easily see how they will transform your images by ticking the Preview checkbox. Choose the destination of the output file and its format. In case you have a large number of images you intend to convert and you would like to automatically modify their filename, here you can also opt for adding a predefined prefix or suffix to the new filename. For example, you can use the date or time as predefined elements that help you keep track of your images. After setting all these details, simply start the conversion process and quickly enjoy your images in a new format. reaConverter is a highly efficient tool for managing a large amount of TGA images on a frequent basis. However, if you are planning to convert only a few TGA files and only once in a while, then you can try online TGA image converter imverter.com. Advanced users can convert TGA files via command line interface or DLL in manual, automated or scheduled mode. You are welcome to contact our technical support when you have any questions about reaConverter. This entry was posted in Image conversion and tagged converter, jpeg, tga on June 29, 2015 by reaconverter.